Comments: Brilliant green and fuchsia hardcover. With bold calligraphic emblem title printed in black on both covers, and again printed in green and fuschia on black spine. 215 x 290 mm. Black & white photographs. First edition, 2006. Sealed copy. 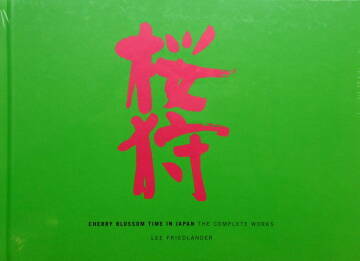 From the publisher: "Lee Friedlander's newest publication, Cherry Blossom Time in Japan: The Complete Works, presents, for the first time, the complete set of 73 images that the artist made during his four trips to Japan. The groundbreaking black and white images--first seen as 25 photogravures in a 1986 portfolio, and long out of print--appear as examples of radical picture-making even 20 years later, as few serious photographers would have dared to photograph cherry blossoms with anything other than color film at that time. The result is a new kind of beauty, with many of the compositions bordering on visual chaos. The images collected here serve as a precursor for much of Friedlander's late landscape work, which was exhibited to great acclaim in his 2005 Museum of Modern Art retrospective.